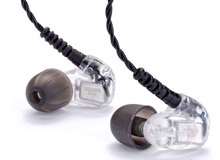 Audio Technica is to introduce three new in-ear monitor headphones at the Musikmesse. Fender has introduced the Fender In-Ear Monitor Series, with five models claiming to deliver an "immersive listening experience". The AES gives Shure the opportunity to present its new KSE1500 Electrostatic Earphone System. This week, you can get 10% off the Nocs headphones and monitors as well as free shipping fees. Earin, a swede company, has funded on KickStarter a wireless rechargeable mini in-earbud project. Pioneer DJ introduces today the DJE series of in-ear headphones which feature a new “bilateral” hybrid design. Shure will launch in June the new SE846 Sound Isolating earphones, included in the SE Series. MPC is not only related to the pad samplers anymore, Akai gives in 2013 that famous name to three new headphones showed at NAMM 2013. Reloop introduces its IN-2 Flash Black headphones designed to be appropriate for use as stage or studio monitors or with smart phones or MP3 players. LD Systems systems' now include the 16-channel ECO series for entry-level users, the MEI ONE IEM system, and the WIN 42 system with 1680 channels.